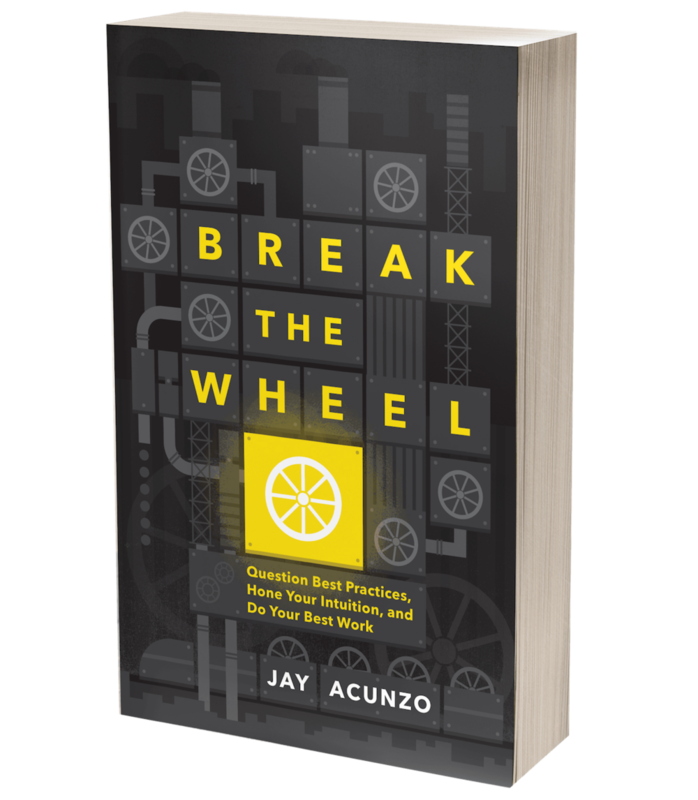 Rethinking How We Structure Content Marketing Teams: The Pod Approach — Jay Acunzo | Author. Speaker. Maker of Shows About Work. Half-Baked Content Marketing Ideas is a series of posts I occasionally publish to share raw, unfiltered ideas about our industry. Some might be good. Most are probably bad or too early to tell. All benefit from your input in the comments. Perspective in the workplace is a funny thing. It’s incredibly valuable to be able to compare and contrast your current role or company to past experiences. You’re able to make sense of the situation at hand and better interpret events as they unfold. You can tell if something feels off or if it’s just part of being in the working world. While at Google, nothing felt more commonplace than a department-wide reorganization, seemingly every 6 months or so. I went through more re-orgs than I did lunch trips with friends (and that is a truth fact). I may have stayed inside the Big G bubble, but I damn sure didn't sit still. They made sure of that. The recent move to create Alphabet was just the most visible and biggest re-org yet. When I heard that news, it felt strangely familiar. And, with literally zero perspective, I thought this all made sense. This was what businesses did to keep up with changing times. They reorganized as a proactive weapon to attack something good, not reactive reflex to something bad. Too often, companies reorganize to simply fall in-line with a new executive's direction or frightening Wall Street demand or worrisome team morale issue. But at Google, it had a purpose. One day we'd be selling search. Then it became display. Then it was mobile. Then YouTube. Then socia--whoops, let's talk about YouTube again, eh? If we REALLY want to commit to this content marketing stuff, and if we REALLY believe in this huge shift in how we operate, we need to staff and structure teams that have a hope and a prayer of succeeding. No more short-order cooks serving dozens of internal stakeholders. No more jargon-filled ideas hatched in conference rooms, nary a customer to be found. (Sweet Baby James, PLEASE involve customers in your process!) No more. According to the best in our biz, we are about to enter a really tough period known as the trough of disillusionment. I know that sounds cool, like we'll all get to battle some zombies or evil witches or something, but apparently it's a business term invented by Gartner, and apparently it's very, VERY bad for many businesses to endure. COMPLEMENTARY: Well-rounded and fits together. Multiple skills for tasks requiring many different abilities. Yanno, like exactly our industry? SINGULAR: Clear goal. Not a million of them. The ability to focus and be great. SHARED: We're in this together. We have a mission. A purpose. And we share ownership. For Google, a pod had an account executive (field sales, owned the most important relationships), an account manager (day to day operations, upselling, product expert, etc. ), and an optimization specialist (helped create and improve AdWords campaigns for clients). These then reported into the same manager, both 1:1 and 1:pods, so we’d have pod meetings with our manager and 1:1s with the same manager. 1. Each pod contains three complementary players: a marketer, a producer, and a lead strategist. Unlike most others in marketing, the producer typically won't aspire to be CMO or CEO but instead live a life that is creative, with a maker schedule (blocks of time to create) not manager's schedule (30- or 60-minute increments of work + meetings). This person is far too often overlooked or misunderstood by marketing organizations and is arguably the hardest type of talent to source and hire. I've heard marketing leaders beat their chests about how "we don't want a writer who wants to write the next great novel," which is short sighted and wrong, in my opinion -- a talented, driven writer can certainly aspire to do that while also making for one helluva content producer for you. These individuals are how you take creative chances and make improvements to the circuitry inside your rocket, not just continually slather more paint on the hull or add more fuel. Want to reach exit velocity? Hire an artist. Want to flame out in the atmosphere? Don't. It's pretty simple. This person is the distributor who ensures the content reaches and converts customers. They can be measured on metrics we've grown used to measuring, like subscribers and other team KPIs, dependent on your goals for a given asset which the pod owns (search rank, iTunes ranking if a podcast, subscribers, leads, MQLs, view and uniques, etc.) Their skills range from demand-gen very broadly to more specific skills like SEO, community management, email marketing, analytics, and, on an emerging level, writing. They'll probably help the producer produce sometimes, after all. This person does indeed aspire to be CMO someday. The strategist is a servant leader. He or she ensures everything and everyone is working well, and they own the big picture and make sure it's crystal clear to the entire pod how they fit that vision. Strategists waver back and forth between the worlds of both the marketer and the producer, being conversational or even fluent in both sides. They also love doing things like advanced analytics and strategy planning, as well as allotting resources, liaising with management teams to keep the other two freed to do meaningful work, and so forth. This person doesn't manage people so much as they manage resources, time, and results. Lots of these decisions and more are guided by, though not necessarily decided upon by, the strategist. This person aspires to be a startup founder or CEO someday. 2. Each pod works on a single asset over time. This notion of campaign-based content marketing is a huge problem, as it turns teams into short-order cooks used to deliver glorified sales enablement materials -- an important function for sure, but not the lone purvey of content marketers. Instead, it's all about growing sustainable assets that deliver value over time, not simply convert people right now then stop working. Few people address this better than Content Marketing Institute's Robert Rose, who says that too many organizations have misunderstood content marketing to be collateral with less brand. S Instead of that misconception of the role, thanks to a pod structure, companies would orient teams around growing what I call "unassailable assets." These are pillar projects, whether a series of things, a destination like a blog or podcast, or a thriving readership among one specific niche that you own. All of these things are "unassailable" because they take awhile to build. Other competitors can't simply replicate them the way they could replicate a single blog post or product demo or testimonial. But they do take time and singular focus. 3. Pods offer several tangible benefits. First, pods are built to be autonomous. They don’t need to sit in meetings all day and figure things out. They have one leader who can, if needed, jump into a meeting, but you ideally can keep talented strategic minds close to the work (and DOING some of it) rather than in meetings all day. Hence the strategist leading the way but not overseeing lots and lots of people -- just two. Maybe there's upward mobility to become a senior strategist or something else to oversee several pods, rather than a single pod/asset combo. I don't know. This is half-baked, remember? I've given this entire notion thought for like, two days. STOP PRESSURING ME! Second, pods are highly complementary teams. This is perfect for functions that are varied by organization and are multidisciplinary. "Content marketing" encompasses a ton of skills and options for your career. It's also different company to company and therefore can't have "one way" to organize -- but maybe this one way lets you invent new variations a little more easily than a vertical ladder structure. If you're in this field as a practitioner, you also have many options to specialize regardless of how your team organizes. Just look at the two words -- content and marketing. Often times, people fall to one extreme or the other (what I call front-end marketers and back-end marketers in the content space). There are different skills you should acquire as a result. Ideally, we'd all be "full stack," but those are rare and special breeds indeed. Pods allow for some degree of specialization to put all the crazy things we need to know in a slightly smaller box. This hopefully can create happier employees who possess a deep core skill and conversational ability across many others (what some call being "T" shaped -- crucial to any career). Third, pods are built to be nimble. I'll spare you another lousy poem. But big, slow teams kill innovation and prevent efficacy in the age of the internet. So by "nimble," I really mean, "in tune with the internet and its users." And make no mistake — this stuff only works well if the pods involve actual people in their processes, whether current customers or prospects and general readers. At ANY scale, great product and engineering teams constantly involve customers in their work. Marketing needs to get smarter about this. If you’re being asked to create a series of articles as a short-order-cook for some internal teammate, not only do you stew on your internal angst for that teammate telling you what to do, you aren’t listening to customers. You start to do fake work. Far better would be for you to understand the customer that bossy teammate is supposed to serve. Then everyone wins. Sadly, I often hear people push back when I suggest you talk to customers by saying things like, "This doesn't scale," or, "My company doesn't allow for that." Do yourself a serious favor if that's your reaction: Change your attitude or change your company. Because without customers involved in your process, you're destined to fail. And it's SO easy to listen to customers. Do you have 20 minutes in the next 2 months to spare? Find ONE customer, and ask them what their days are like. 20 minutes. One customer. That's all. Fourth and finally, this hastens our mentality shift. By organizing around a single project, rather than churning out disconnected flyers for sales or search engines, we can start to view content marketing as it should be viewed: The continual development of assets that grow and generate results over time, much like a product. In the end, this is the huge shift we need as marketers. This is like turning an aircraft carrier, sure, but we've got some momentum behind the turn, if we can just keep going! Reorganizing can help, not as a reactive measure, but a proactive, opportunistic tactic. We all claim to aspire to be the Red Bulls-AmExes-Coca-Colas-Krafts-and-so-forths. We positively drool over them, but then we refuse to organize our work and our teams accordingly. Perhaps these pods could work. Perhaps organizing in small, complementary teams of happy people is the way to go. That’s the dream. That could be huge. But it doesn't need to be big. And that's the entire point. What's this "One Different Thing" all about? I believe content marketing would be a much better industry for both practitioners and audiences if we tried to do just one small, different thing in each piece we created, rather than churn out more similar junk. Read more about the One Different Thing challenge. Posted on September 29, 2015 by Jay Acunzo.